The Mount Rushmore National Memorial in South Dakota is a remarkable granite sculpture of four former United States Presidents. About 2 to 3 million people visit every year to observe the immense structure, which covers more than 1,200 acres and stands 5,725 feet above sea level. From left to right the presidents aptly represented are George Washington, Thomas Jefferson, Theodore Roosevelt, and Abraham Lincoln. The sculptures are meant as a representation of the first 150 years of U.S. History. Construction of the project began in 1927 and concluded in 1941. The idea was conceived by historian Doane Robinson in order to promote tourism in South Dakota. The area was redeveloped and visitor facilities such as a museum, a visitor center, and the President Trail were eventually put in place. As a result, tourism has grown in the region and is currently South Dakota's second-largest industry behind agriculture. The site hosts the final concerts of Rushmore Music Camp. The Sturgis Motorcycle Rally is held every year in August, attracting hundreds of thousands of people. 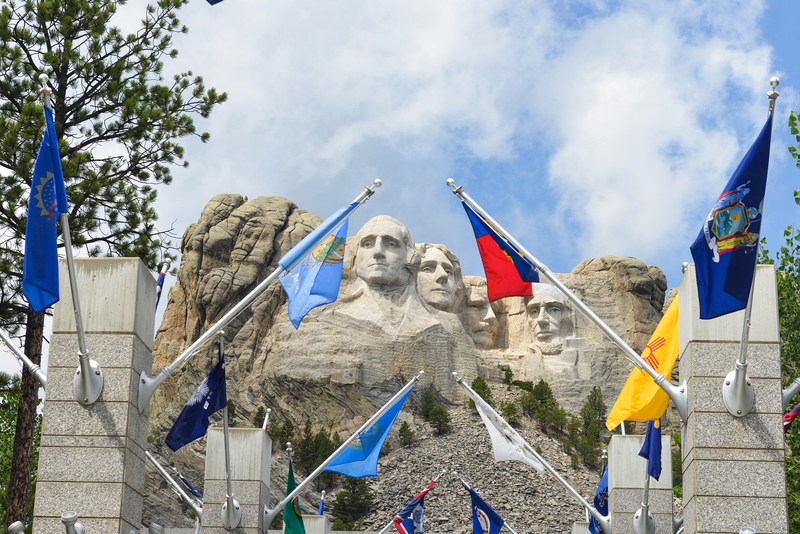 The Independence Day Celebration at Mount Rushmore and the Crazy Horse Memorial 8 miles away also attract many visitors every year. There are a lot of recreation options in the Black Hills area including museums, trail rides, waterparks, golfing, go carts, shopping, casual or fine dining, and much more! Outdoor adventurers like to explore the area biking, horseback riding, 4-wheeling, or rock climbing in the summer. Boating and other water sports are popular on the surrounding mountain lakes. In the winter, there is cross-country and downhill skiing, snowmobiling, and ice climbing among other sports. The Badlands National Park is nearby as are many more spectacular national monuments. The Black Hills region of the country has an array of wildlife. Wild turkeys, Bald Eagles, and hawks are often seen flying around the South Dakota sky. There are also many mammals including Rocky Mountain Goats, Bighorn Sheep, raccoons, beavers, and bobcats. There are also several species of frogs and snakes native to the area. Walking paths around the park lead through stunning wildflower gardens in the spring and summer. Native Americans who first inhabited the land once used some of these flowers medicinally and to spice food. The flowers and other plants are very aromatic. Most of these colorful flowers like Wild Blue Flax, Wooly Vervains, and Purple Cone Flowers bloom in the summer. Ponderosa Pine Trees, found all over the slopes of the Black Hills region, have a sweet smell like vanilla. Red squirrels live off these trees and elk eat the grasses below them. There are also aspen, birch, spruce, and oak trees in some surrounding forests. There are no overnight facilities at Mount Rushmore and camping is prohibited. Sturgis and Keystone are within miles of the monument and have superb facilities including the Presidents View Resort, Mount Rushmore's Chalets, and Palmer Gulch Resort. Many rooms have views of the monument and are minutes from Black Hills attractions. These plush resorts have numerous quality amenities fit for a President! Mount Rushmore: An Enduring Tribute to A Free Country!